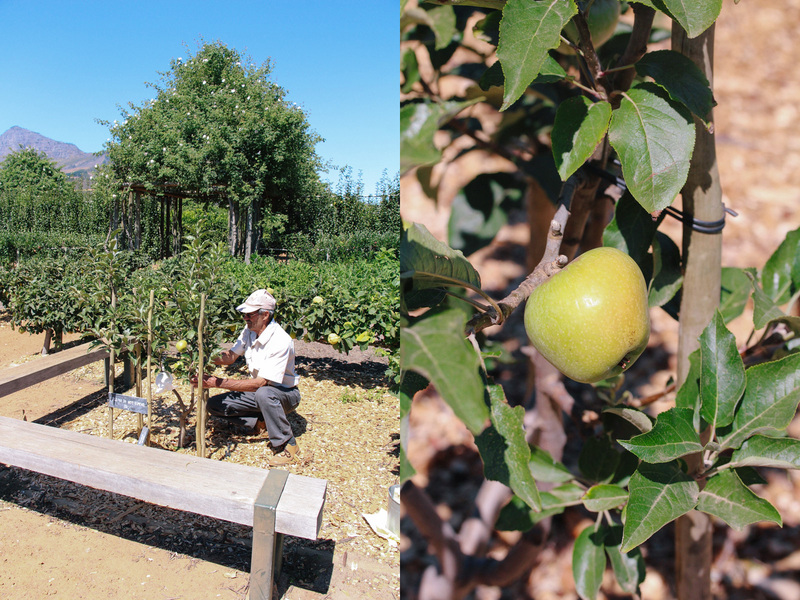 Winter Pearmain, a delicious apple variety, is an ancient fruit grown here in our garden under the watchful eye of Oom Anton Roux. For many years he ran his own nursery, where he propagated and grew varieties of old-fashioned gems. Ever since we started the garden on the farm, he has been experimenting here – growing quinces, medlars and old-fashioned apples. The origin of this rare apple, also known as White Winter Pearmain, remains a mystery, although it seems to have been around since 1200. First brought to South Africa around the 1900s by Harry Pickstone, by the 1950s the Winter Pearmain had become one of the most popular apple varieties exported from South Africa to Europe. 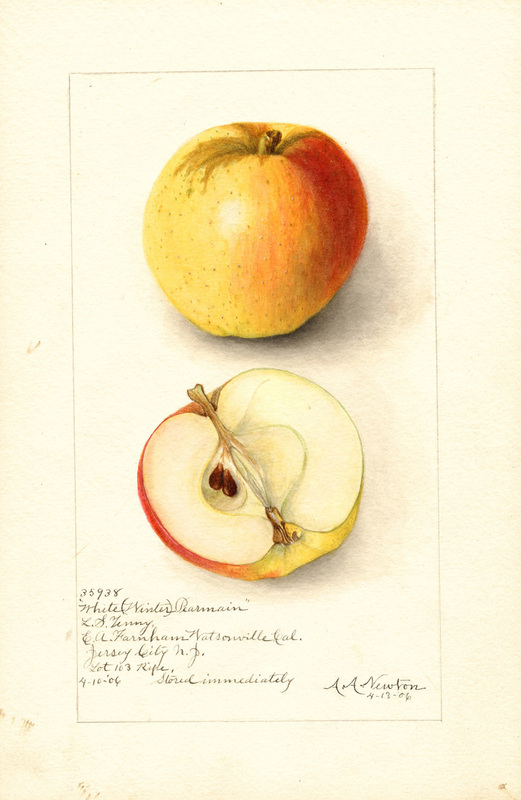 This fruit originally flourished in South African soil, but due to its susceptibility to bitter pit, and the increased popularity of newer apple varieties, planting stopped after 1960. Oom Anton searched far and wide to get his hands on a cutting of the original Winter Pearmain, which he remembered from his childhood. A visit to a farm in Villiersdorp delivered this rare find, which he grafted onto a Golden Delicious rootstock. Today, we are fortunate to have but one young tree, merely three years old, to remind us of a bygone era. The fruits are medium sized, round or lobe shaped, yellow to pale green in colour with pink cheeks and brown speckles. For exotic fruit trees like these, Oom Anton suggests planting them into well-prepared soil with ample organic matter and keeping them watered and mulched. When Oom Anton describes the taste, he gets carried away by nostalgia: “sweet, juicy and tender”. We’re waiting in anticipation to bite into the crisp goodness of this year’s first crop. Had lunch there yesterday and were offered a blood lemon as a sample taster. Request more detail about this fabulous fruit. Found this article very, very interesting … I am an 89 year old, who remembers very well, my grandmother, always insisting on buying only Winter Pearmain apples ! I remember them being very juicy and very tasty … and have always wondered if I would ever come across these in our supermarkets again ? Do you know whether they are available anywhere today ? As far as we know they are not commercially available anywhere. Anton Roux is growing these trees from cuttings he took from an old tree in Grabouw. Hopefully, they’ll come back in fashion one day. I used to buy South African Winter Pearmain in the 1960s and remember them, particularly as they were the apple equivalent of Asti Spumante. I loved them and I wish we could still buy them in the shops. They were my favourite apple, and to this day, nothing has come near to the taste of those apples.